We first see a churning sludge of wet cement in close-up. Then, after we’re nearly lulled into its grinding trance, a body is tossed into the vat with a shocking thwack, face-down, and is then covered with concrete. Though it will never be made clear whose body this is, carelessly thrown like a rag doll, the force with which it hits the mix reverberates throughout the rest of My Joy. Bodies, living and dead and somewhere in between, heave and collapse with horrific intensity throughout the film, the first feature by Sergei Loznitsa, a Belarus native who has been making acclaimed sociopolitical documentaries, reportedly underseen even in Eastern Europe, since 1996. Though My Joy occasionally flirts with nonfiction conventions (surveying faces with clinical attention, allowing its camera to take in landscapes with pointed exactitude), this is a deeply allegorical work that makes sport of narrative and character in ways that perhaps only someone not enslaved to fiction traditions would dare. At once amusing in its details and frightening in its scope, My Joy is an anguished howl of social disorder. That corpse in the prologue could be anyone caught in society’s gears. This is not simply another dispatch from Eastern European hell, though—it’s closer to something abstract and off-kilter like Ilya Khrjanovsky’s 4, but even more rigorously metaphorical in its incorporation of twentieth-century Russian history—in this way it might remind some of Alexei Guerman’s masterfully cryptic 1998 Khrustaliov, My Car!, which followed a military doctor’s nightmarish journey towards Stalin’s deathbed. Loznitsa proves himself to be as sophisticated a digressive storyteller as Guerman with My Joy, a tale of multigenerational hardship that seems to be about nothing less than history’s endless cycle of violence. Full of flashbacks and seeming non sequiturs, My Joy nevertheless stays on a tangible single narrative track, following one man, Georgy (Viktor Nemets), after he packs up his thermos, leaves his wife, and takes off in his truck full of flour sacks through deepest Russia. Many other characters loop through Georgy’s story, and only midway through do we realize the sophisticated cross-hatch-like structure Loznitsa has devised. His storytelling strategy— new characters are introduced in their own compartmentalized scenes before we realize how they fit into Georgy’s travels—gives a special, incorporeal credibility to each and every person on screen. My Joy has the feel of a tapestry, united by one enigmatic central figure. Another major surprise of My Joy is that what initially appears to be a road movie (even in its own idiosyncratic way it adheres to that genre’s conventions) turns out to be something far less linear. For the film’s first half, though Loznitsa bobs and weaves, we follow Georgy on his straight route to God knows where; but both Georgy’s destination and Georgy himself will be altered drastically by film’s midpoint. Like the Russian pop song heard at the beginning of the film on his truck radio, which nearly conceals its violent, dreadful lyrics with a catchy, upbeat rhythm and melody, My Joy is both escape and imprisonment, which begins with the promise of the open road but blocks freedom at every turn. 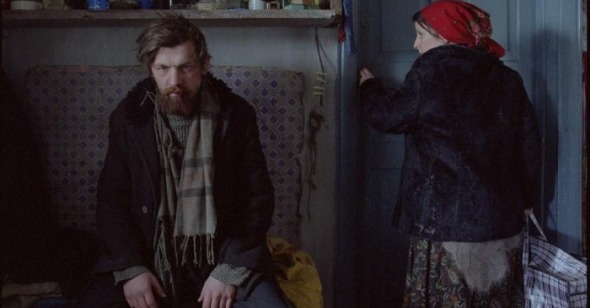 Its portrait of contemporary Russia as a labyrinthine, dysfunctional jailhouse, eternally caught at a crossroads between a violent past and a depressed present, was unsurprisingly met with resistance from the Russian press and authorities—the film’s acclaim at Cannes baffled many back home, who have proceeded to distance themselves from this upstart filmmaker. The fact that such a heavily allegorical, narratively tricky film would incite anger is a testament to the inherent power of Loznitsa’s imagery; the cumulative impact of My Joy’s many jarring episodes announces him as a potentially major filmmaker. At first there’s something downright Buñuelian in the director’s willingness to stop Georgy’s story cold to take us to another place entirely, whether it be a flashback or a parallel track of a character with whom the protagonist hasn’t yet converged. Early in the film, we temporarily abandon Georgy to hear the tale of an elderly man who had pounced uninvited into Georgy’s passenger seat: he had been a young lieutenant in World War II, betrayed by a commanding officer on his way home after fighting had ended. It’s not the last time Loznitsa will jump into the past—a second, even more violent reminiscence awaits, concerning two Russian soldiers who mete out ideological punishment on a young widowed pacifist and father who kindly provides food and lodging for them in his countryside home. In both of these sequences, the Russian military comes across as less than heroic, always ready to kill for revenge, and the mercenary nature of their actions taints the ramblings of the contemporary characters as well—the barbarity of the past is heaped upon the present, Soviet-era violence begets post-Soviet savagery. Nearly all of the people Georgy comes across in the first half of My Joy are wanderers themselves—the former WWII lieutenant (who disappears from the truck and the film when Georgy stops for diesel); a wise-beyond-her-years teenage prostitute who throws herself at him during a horizonless bumper-to-bumper traffic jam; a bedraggled cadre of thieves who approach Georgy’s truck, parked in a forest clearing, in the middle of the night. At the same time, Loznitsa ensures their freedoms are short-lived. A terrible, unforgiving authority lies in the wait at the center of My Joy, manifest as a highway patrol station in the middle of a barren back road. Manned by power-tripping traffic cops, constantly flagging down passing cars and demanding papers for no foreseeable reason, this demonic outpost will appear crucially twice in the film, once early on, when Georgy smartly escapes its clutches, and once again at the end of the film, which explodes into pure dystopic nightmare. By this point My Joy has already tipped over into the macabre. In the second half, Georgy has become a bearded, mute shell of his former self, treated like something of a village idiot in the wintry Russian backwoods he now calls home. Those he encounters are all seemingly touched by the specter of death: two men are transporting an occupied coffin in their truck, and one of them has visions of a hanged man in the forest; an elderly hitchhiker turns out to have been a former digger of mass graves; even the house he is allowed to stay in (against the advisement of the community authorities) turns out to be the former dwelling of the bludgeoned World War II pacifist. Heightening the cosmic bleakness of the circumstances of My Joy’s characters is the elegantly claustrophobic framing by cinematographer Oleg Mutu (whose intense, tightly framed work on The Death of Mr. Lazarescu and 4 Months, 3 Weeks, and 2 Days helped bring the Romanian New Wave to international critical prominence): we are kept close to these people, even as violence might spring unexpectedly from some corner of the frame at any time. An outsider’s view of Russia that takes place deep inside its darkest crevices (though largely shot in Ukraine), My Joy will undoubtedly resonate the most with viewers familiar with the country’s recent history, or perhaps especially those who’ve had the experience of living within its borders. It’s a portrait of a lawless, godless social order that circumvents mere nihilism by virtue of its humane fascination with the people trapped inside it. One beautifully curious long take, ostensibly starting as Georgy’s point of view, snakes its way through a crowd of impoverished villagers. One by one it takes in the faces of the rural folk—there’s no condescension, just eye-level empathy, as the camera trains itself one person after another, including a scowling man angrily bursting past the camera and an elderly woman in a kerchief who seems to have simply stumbled through. In Loznitsa’s view of today’s unseen Russia, these are perhaps the missing people; the film could decide to pick up and follow one of them at any point—that Georgy is this film’s protagonist is mere circumstance. Excitingly, Loznitsa is still early in his career and has a lot of people left to follow down these untrodden paths.